The next version of SysML, the modelling language based on UML for Systems Engineering projects, should be released in June as version 1.3 beta is currently listed on the OMG.org website. Even though SysML 1.3 beta specifications aren’t released yet, it’s already covered in the Second Edition of “A Practical Guide to SysML” book by S.Friedenthal, A.Moore, and R.Steiner (ISBN : 0123852064). 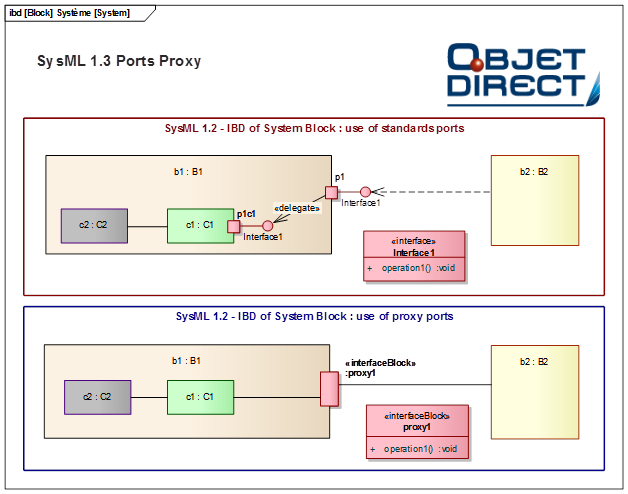 SysML 1.3 main changes apply to ports, distinct interaction points on Blocks. 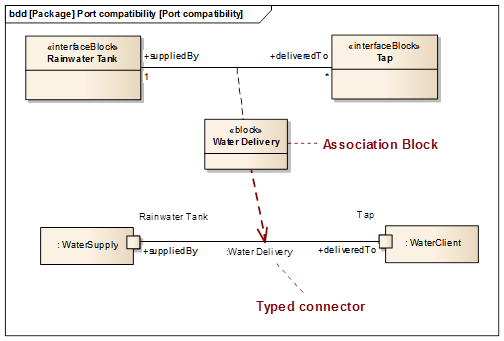 In the current version (SysML 1.2), there are two types of ports: standard ports to describe service oriented peer-to-peer interaction through provided/required interfaces, and flow ports to describe items that can flow in and out the block. 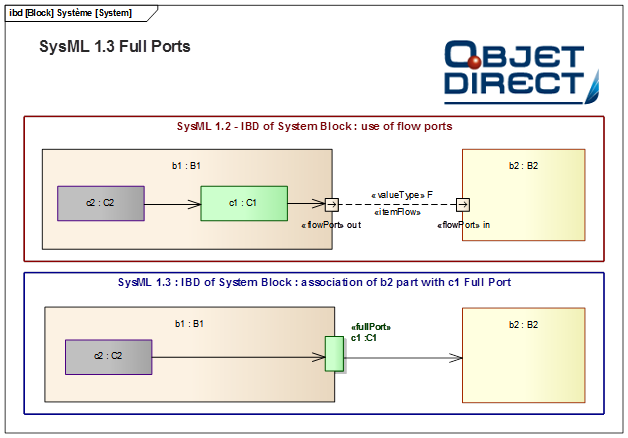 Flow ports and Port specifications are deprecated in version 1.3, but the concepts remain: SysML 1.3 replaces them with two new types, Full Ports and Proxy Ports, both allowing to combine operations to call, and items to flow in and out the block. ● Nested ports and nested flows have been introduced in SysML 1.3 to specify an additional level of ports within a port. As shown in the following diagram, the port p1 has two nested ports to associate external blocks directly with the AC in and Audio out. 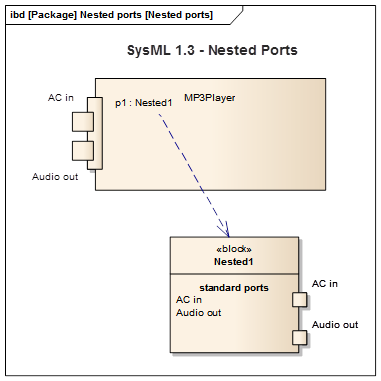 SysML 1.3 has revised the concept of Ports to provide a more complete approach and definition compared with version 1.2. For instance it prevents from duplicating ports when a Block both needs to provide or require operations and have items to flow in/out. This approach could have a significant impact on how you organize and model your system since interfaces are no longer exposed by ports. Instead, it will the block used as the type for the full port, that will realize or use interfaces, or itself own operations. Once SysML 1.3 is available, it will be interesting to see how SparxSystems will implement it in Enterprise Architect so these new features are easy to use (e.g. with the IBD, to move an internal part of the block to a full port). A feature to easily convert a project from SysML 1.2 to 1.3 whilst keeping a good control over the changes would be useful.